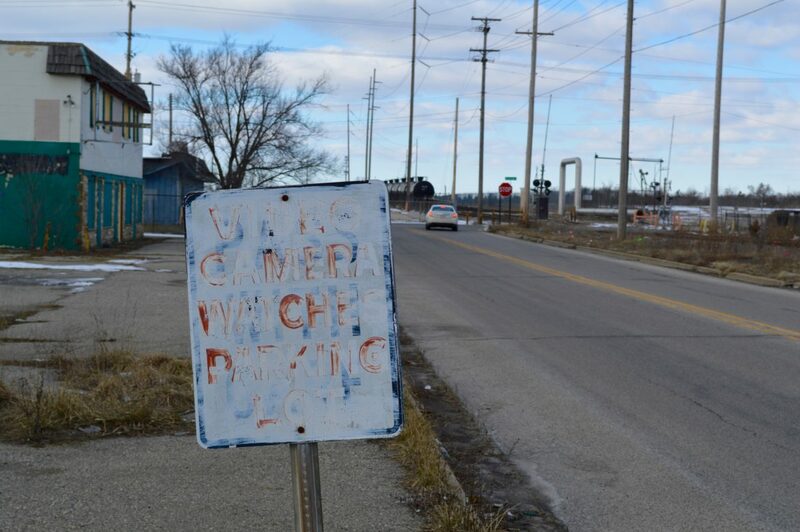 A rusted sign that used to read, "Video camera watches parking lot," sits outside an abandoned building in Lansing Township. Photo by Hannah Holliday. For 58-year-old Lansing Township resident Sherry Ellis, abandoned buildings impact the township’s look but not the resident’s attitudes about where they live. The green and white bricked building located on the corner of Clare Street and West Michigan Avenue isn’t a symbol of the Michigan State Spartans. The windows are boarded up, the paint is peeling, overgrown weeds are starting to take over and the bricked walls hold nothing more than the words “Jokr,” sprawled out in purple spray paint. The vacant building near the intersection of Clare Street and Michigan Avenue is becoming a forgotten property. Photo by Hannah Holliday. Township residents like Ellis feel that new businesses coming to the area are more likely to search for commercial space near Eastwood Towne Center, located in the north east side of the township. According to the Charter Township of Lansing Master Plan drafted in 2010 and updated in 2014, Eastwood is an additional 313 acres of land devoted to retail and service land uses. Therefore, the west end of the township, developed in the early 20th century according to the Master Plan document, contains several abandoned buildings and vacant pavement zones near the intersections of Clare and West St. Joseph streets which go unnoticed. Businesses looking to relocate to Eastwood Towne Center are looking to keep building costs low and are interested in new building structures. Lansing Township Supervisor Diontrae Hayes said that a lot of things are in the works at Eastwood, including the new development of another hotel, the Hilton Homewood Suites. Justin Hollander who is an associate professor of Urban and Environmental Policy and Planning at Tufts University, said after 30 years both commercial and residential buildings need to be rebuilt. For developers, location is a huge deciding factor. A vacant building sits near the intersection of Clare Street and Michigan Avenue. Photo by Hannah Holliday. 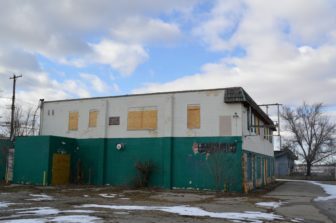 These vacant commercial spaces can also impact more than just local residents but also businesses owners who are located in close proximity to vacant lots since it reflects low community morale. Bichnogoc Ngoc Tran has been working at his wife’s small business, Nu the Tailor, for the past 21 years on the intersection of South Waverly Road and West St. Joseph Highway. He has been around long enough to see the area change, but says that business hasn’t been effected by the area’s vacancies since his wife’s store has gained a strong customer following. Although, he has noticed the increasing number of nearby vacant store fronts and lots. Hayes said in late January that there are no concrete plans for new retail stores on the west side of the township, but that new industrial businesses located near the two vacant General Motors plants are starting to sprout up, including a trucking company. A rusted sign that used to read, “Video camera watches parking lot,” sits outside an abandoned building in Lansing Township. Photo by Hannah Holliday. 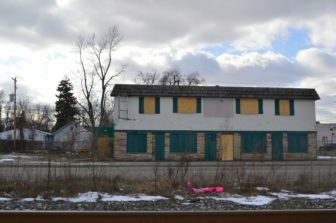 Even though these abandoned properties aren’t immediately affecting all businesses located on the west side, such as Burger King, Spud’s Diner and Quality Dairy Store who all have a steady flow of foot traffic, a possible future impact could be probable. These vacant properties can also place immense costs on communities and local governments Hollander said. According to the township’s master plan, five percent of the existing land that could be used for potential development was paved and open vacant land as of 2009. 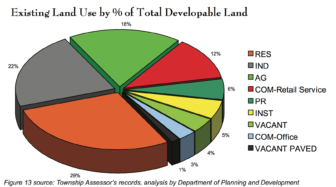 A pie chart of the existing land use by % of total development land used in the Charter Township of Lansing Master Plan 2009 document. Photo by Lansing Township Assessor’s Records. Map of the Lansing Township existing land usage legend. Detailing the areas of vacant open and paved land. 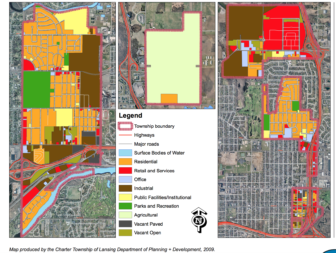 Map produced by the Charter Township of Lansing Department of Planning + Development. In addition to the township’s existing vacant lots a 121-acre property where the Waverly Golf Course once stood is also vacant.